Patients are generally able to resume a clear liquid diet the evening of surgery and be advanced to a regular diet the following day. Antibiotic coverage can be maintained for a 24-hour period following surgery. Incisional pain may be controlled with intravenous narcotic medications and then switched to oral agents once a regular diet is started. Routine laboratory tests including a complete blood count and electrolytes may be drawn the first postoperative day with further blood test drawn only as needed on subsequent days. 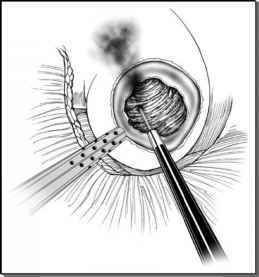 For uncomplicated cyst ablation cases, the urethral catheter is removed the day after surgery once the patient is fully ambulating and the patient discharged on postoperative day 2 or 3 once a regular diet is tolerated and pain is controlled with oral agents. In cases of a collecting system injury where placement of an internal ureteral stent and retroperitoneal drain were required at the time of surgery, the urethral catheter can be removed when the documented retroperitoneal drain output is minimal (usually by postoperative day 2 or 3), followed by removal of the retroperitoneal drain if its output does not subsequently increase. In the case of collecting system injury and repair, the ureteral stent is left in place for two to four weeks depending on the extent of injury and removed cystoscopically in the office. In the rare case where the retroperitoneal drain output remains high, the ure-thral catheter should remain in place and the retroperitoneal drain taken off the bulb suction to discourage formation of a urinary fistula and to encourage antegrade drainage of urine with spontaneous closure of the collecting system. If stable, the patient may even be discharged home, and the drains subsequently managed in the office in one to two weeks. Repeat imaging studies (e.g., computed tomography) should be considered to confirm proper positioning of the ureteral stent within the collecting system in cases of persistent drainage despite the previously described maneuvers. In the postoperative period, an urinoma and/or perinephric hematoma should be considered in the differential diagnosis in patients who exhibit persistent low-grade fevers (>38.5°C), ileus, nausea and vomiting, and leukocytosis. Contrast-enhanced computed tomography can be used to confirm the diagnosis. In cases of an unsuspected hematoma, conservative management with blood transfusion as needed is usually sufficient. Rarely is renal arteriography with selective embolization or reoperation required. In cases of a postoperative urinoma, a urethral catheter is reinserted as well as either an internal ureteral stent or percutaneous nephrostomy tube. For an undrained collection, percutaneous placement of a retroperi-toneal drain may be required if one was not placed at the time of the initial operation. If histopathologic and cytologic analysis of the cyst wall and fluid confirms the presence of malignancy, a staged partial or radical nephrectomy should be discussed with the patient. This can be performed either laparoscopically or through an open approach ideally within one week of the initial surgery.